Absorbase Ointment (White Petrolatum-Mineral Oil) is an emollient (moisturizer) used to treat and prevent dry skin and skin irritations such as diaper rash and radiation burns. It works by forming an oily barrier on the skin to trap moisture in the skin itself. 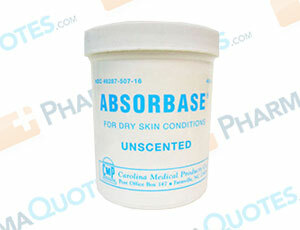 There are no known side effects associated with absorbase ointment, but it should be used as directed. Before application, the affected area should be cleaned. If prescribed to treat diaper rash, it is important the skin is cleaned so that bacteria isn’t left beneath the oily barrier. If prescribed to treat radiation burns, patients should discuss when to apply this ointment (before, during, or after treatments). In some cases, a doctor may recommend Absorbase to treat eczema or psoriasis. If your doctor recommends or prescribes absorbase, it is because he or she is aware of your medical history and current medications. Absorbase should be used with caution in sensitive areas like the groin or vaginal area, and face near mouth, nose, or eyes. General Absorbase Ointment Warning: The above information is for informational purposes only and is not meant to be a substitute for professional medical advice, diagnosis or treatment. Please seek professional medical advice before starting, changing or terminating any medical treatment. Pharmaquotes is not offering medical advice, pharmaceutical recommendations or endorsing any specific prescription drug, pharmacy or other information on the site. Pharmaquotes provides no warranty or guarantee for any of the discount data, medication, or other information.